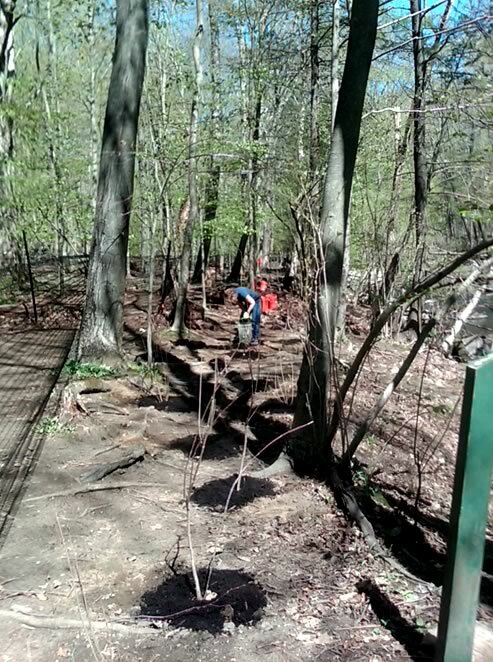 On Wednesday, April 27, 2016 The Friends of Mianus River Park, coordinated its Spring 2016 restoration Project. 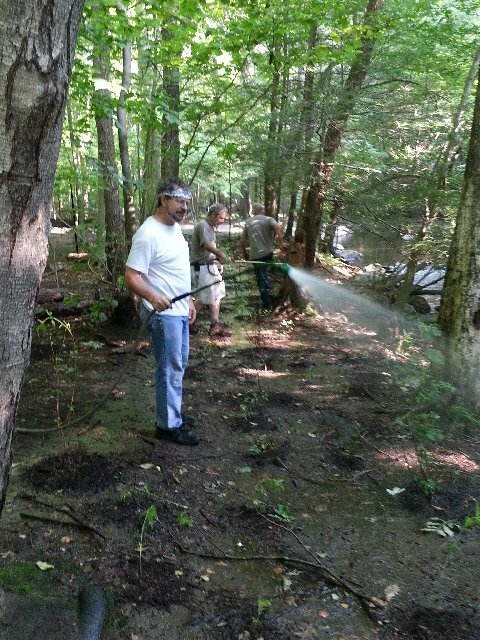 Aquarion Water Company's employees joined Friends of Mianus River Park and cleared invasive non-native plants and other debris from the first 340 feet of the River Road Trail (downhill side) and then planted 125 assorted native plants, including Inkberry, Large Cranberry, Low-Bush Blueberry, and assorted ferns. The group installed posts and beam fencing along the road to give the plantings a chance to grow and allow the understory to become restored. Finally, the volunteers ran a deer fence along the river trail. Eastern Land Management will water the plants in May and June. 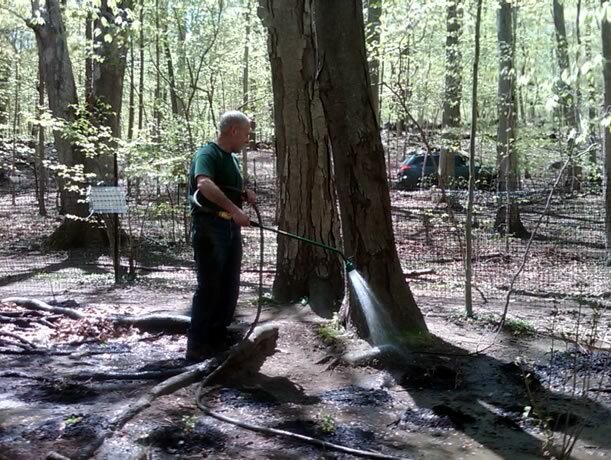 This was the third year that Aquarion Water Company has sent a crew to Mianus River Park as part of its Earth Day celebration. 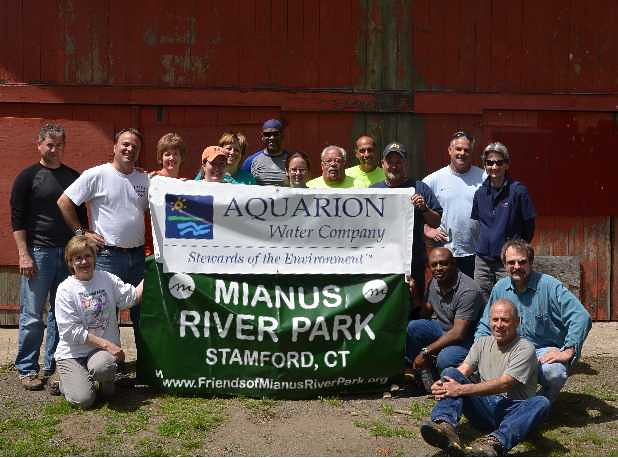 On Wednesday, April 29, a large group of enthusiastic volunteers from Aquarion Water Company joined the Friends of Mianus River Park to plant over 300 trees, shrubs and ground cover plants in the park. Planting was done in the “urban oasis” created last year by the Friends, Audubon Greenwich, the City of Stamford, Treetops Permaculture, and Aquarion, and in two adjacent areas. This was part of the continuing effort to restore eroded riverbank and nearby areas with native, bird friendly plants. Existing fencing around the area was raised to keep out deer. Planting is one thing but keeping the plants alive and well during the hot summer months is a major challenge. 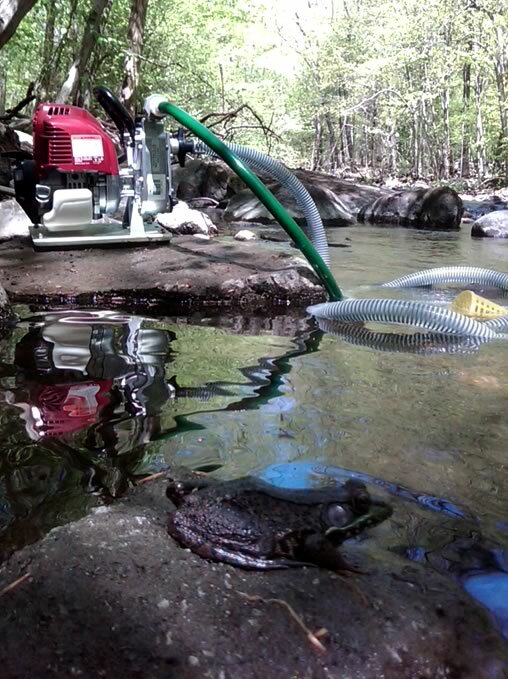 To deal with this problem, FoMRP volunteers bought a small pump and installed hundreds of feet of irrigation lines, with couplings for 35-foot portable hoses and water spray wands. Although frequent rain has been a major help, teams of Friends' volunteers have been watering these areas on a regular basis. Finally, on Wednesday, June 26th, after a hot week without rain, our volunteers had to once again reactivate our new watering system. Visitors to the park increasingly are seeing the benefits of these efforts. As the photo below illustrates, areas planted in previous years are now looking much greener and more natural than the bare compacted areas on the other side of River Road. 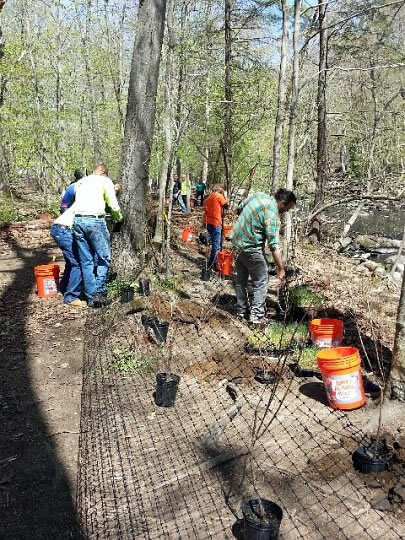 In honor of Earth Day—in our continuing effort to create a sustainable solution to the wear and tear on the Mianus Riverbank—we planted 250 feet of the eroded riverbank downstream of the second hardened access (or the Boulder Pool as some call it) that Trout Unlimited installed last year with partial funding by the city of Stamford. 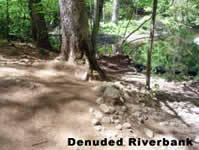 In addition, we moved the hiking trail away from the River. The streambank and old trail were planted with native plants and a fence was installed to limit access to riverbank while the new plants get established. The project will minimize erosion of the riverbank; improve water quality and habitat for water dependent (and inter-dependent) species of fish, birds, insects, and amphibians. The project also provides additional protection of water quality for Aquarion’s public water supply intake downstream. The work was done from April 30 through May 6 with volunteers from Aquarion Water Company, the Friends, students from Greenwich Academy and Brunswick School and day workers from Labor Ready. Our preliminary estimate is that at least 140 volunteer hours went into the project. The City of Stamford supplied mulch, laminated signs and consultant support from landscape architect (Bryan Quinn of OneNature) before and during the actual planting. Don Brownstein, of the Treetops Estate allowed us to use his green house as the staging area for the plants. The primary source of valuable soil is deadfall trees that decay. That is why we leave them on the ground. Also, the decaying trees provide valuable habitat for a variety of insects and animals that increases the biodiversity and health of the park. Geological research determined that the glaciers stripped this area down to rock and left piles of sand and stone when it retreated. Known as glacial melt-out till, the soil in this area is a mixture of clay, sand and gravel. Considering this location is in a riparian corridor, floods will result in the erosion and re-deposition of sediment and sands. Although—through gradual re-vegetation, reforestation, and accumulations of decaying leaf, trees and plants—the soil has evolved over time, it is easily erodible and supporting vegetation is a slow process. It will take a long time for plants to get established and grow in this sandy, easily erodible soil with low organic content. 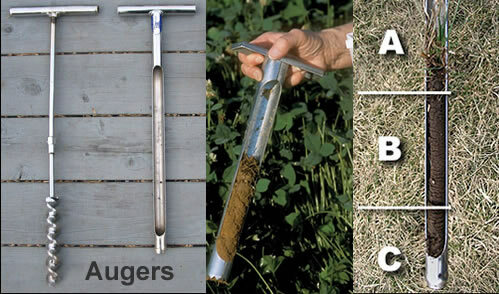 Any damage to the plants or disturbance to the soil makes it more difficult for them to survive. The plants were chosen for the location, soil type and shade tolerance after consulting with experts. They were purchased from New England Wetlands, a wholesaler used by the City of Stamford who has worked with us throughout the restoration process. Bryan Quinn of OneNature, a landscape architect, helped finalize the planting plan and provided instruction on the way to plant and the location. The health of Mianus River depends on the health of the Park, both along the riverbank and in land. When the riverbank erodes—a process caused by foot, paw and tire traffic—the sediment flows into the river, making it shallow, wide and inhospitable to critters that dwell there. This in turn effects the entire ecological food chain, degradating the water quality and habitat for all the water dependent (and inter-dependent) creatures and ultimately... the water quality for all of us, as Aquarion’s public water supply intake is a bit further downstream. The solution is to restore the plants that grow on the riverbank. To protect the plants we need to fence them off. We would love to be able to just post a sign asking all to avoid the plants but unfortunately that does not work. We hope that in the future—as park users see the benefit of the new plants and a healthy rejuvenated river—the fencing will no longer be necessary. 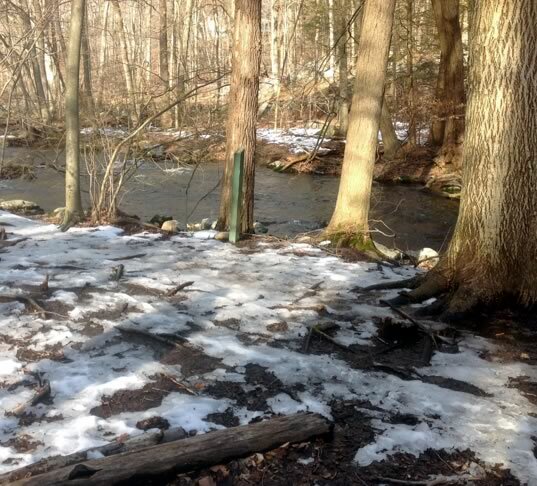 We also fenced in an area above the river to allow the spring growth to take hold. The area was being degraded by numerous short cuts and the spring buds were being trodden down. If there isn't any new growth in the forest understory, then there won't be any new trees to replace the ones that die. Without the trees and plants, there won't be any birds and eventually in time there won't be any forest, which also impacts the river. Though some of the plants we have planted over the years are still struggling, the difference between the areas where we have planted and fenced and those where we have not, is clear. 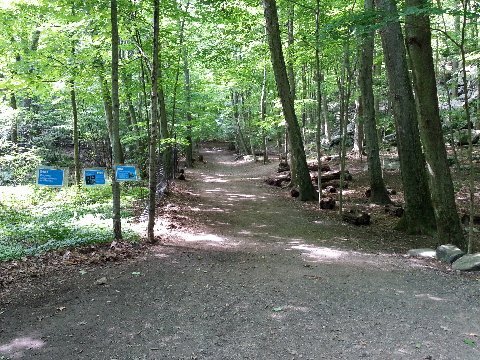 Again, we would hope that as we reestablish the understory and users see the benefits of staying on the trails, that we can take down the fencing. How quickly the fencing comes down is really up to the users. Before: Southern (downstream) location of project area. Note the green post with the number “2” on it. Before: Upstream view of streambank project area showing location of trail near river and lack of buffer vegetation along river and stream banks. 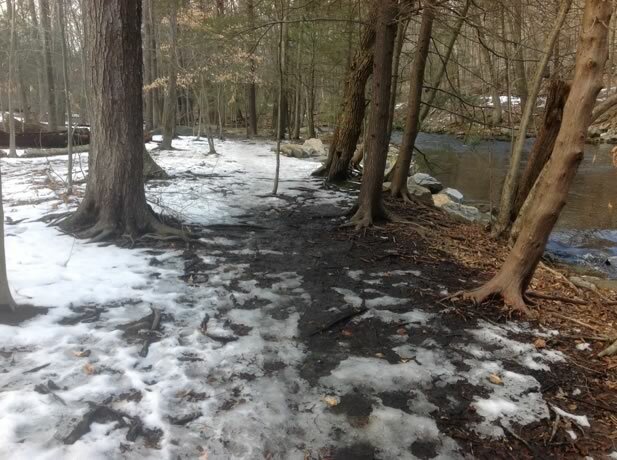 The trail has been located away from river and planted. After: Upstream from green post #2 showing plantings on old trail and riverbank. 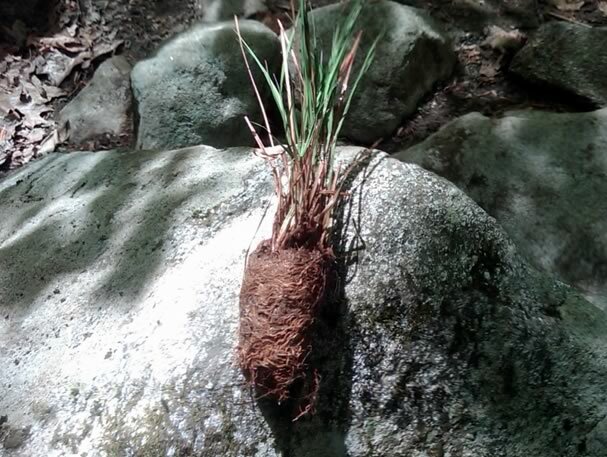 Grass plug before being planted along the riverbank. Pete Sofman watering new plantings with the new portable pump. Portable irrigation pump in operation to water new plantings. Frog in foreground supervising the activity. 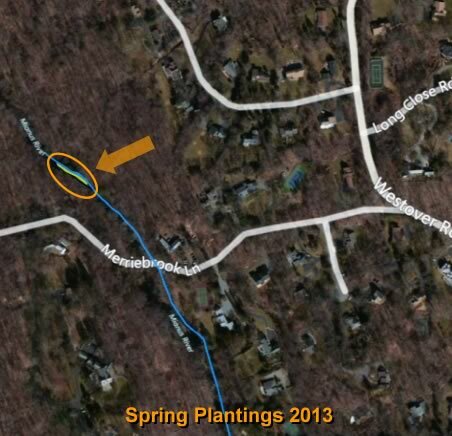 Approximate Location of Mianus River Streambank Restoration – April 30, 2013. 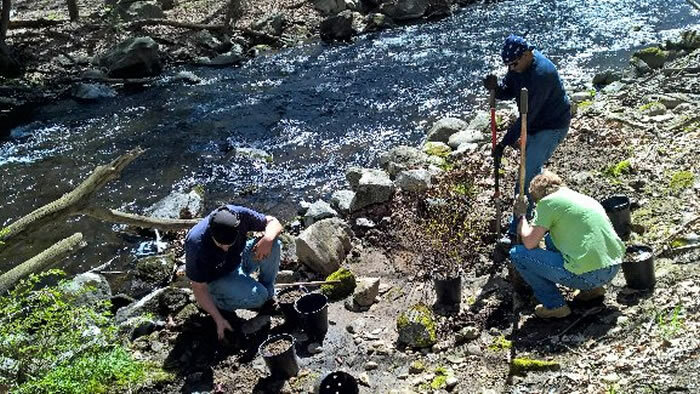 On April 26 and 27th (2012), Friends' board members and other volunteers planted over $1,000 of plants in the area immediately north-west of the bridge over the Mianus River. (Click on thumbnails to view photos). The cost was financed by Friends' group membership fees and by donations, with special thank to Peter Pratley of the Pratley Company LLC. The area planted has suffered from heavy use and was severely compacted. In addition, its close proximity to the river had resulted in soil run-off into the river, which provides water supply for more than 150,000 residents. To protect the area and the new plantings, the area has been closed by temporary fencing. Previous efforts to close the area without fencing had failed. To assist in this crucial stage in park management, users are asked to walk the short distance up the road to the main entrance. While closed to vehicles, the road is open to pedestrians. Please join our Friends of the MRP, if you haven't already. We need your help. Back in June on National Trails Day, The Friends undertook a riverbank restoration project, at the intersection of the River Road Trail and the upstream end of the Meander Trail. At this time, we (1) spread top-soil on the eroded hillside leading to the river, (2) put down coconut grass and (3) put up a deer fence. The top soil came from the City of Stamford and the fencing and coconut grass were purchased with donations to The Friends of Mianus River Park from park users. (see photos) The project has held up well despite the torrential rain and flooding. On Saturday, September 17th, Pete Sofman, Meg Scarpetta and Mary Ellen Burns, all of whom serve on the board of the Friends of Mianus River Park, spent Saturday morning planting native plants. The plants were all purchased with donations from the park users who have become members of the Friends of Mianus River Park.